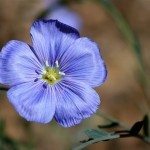 We have had an abundance of flax flowers in our backyard. What should we do with the plants at the end of the growing season? Should they be cut down or left during the winter? You can simply leave it as is to cut in spring or you may cut the dead growth back to the ground now. Either way is fine as the plant naturally goes dormant and will regrow in spring. Many people choose to leave the old foliage growth as extra protection during winter, however.